Welcome to the Haymarket IcePlex located in historic Haymarket, Virginia on 15155 Washington Street; behind Piedmont Tire. We have been open for 7 years and now have 2 surfaces to skate on. On this web site you will be able to find information about our programs including hockey leagues: travel and recreational, group skating lessons, birthday parties, figure skating, synchronized skating, try hockey for free, learn to play hockey and more. Our intention is to provide the best experience on- and off-ice for Haymarket and the surrounding communities. Please create an account with us by hitting the "Registration" tab above. Then hit the upper right hand corner "Create Account" tab and fill out all information needed. Once you complete this process, you can register for all activities through your Haymarket Iceplex account. Feel free to contact us with questions or feedback - we'd love to hear from you! Upcoming sessions of Try Hockey for Free and Learn to Play Hockey Ages 11-17 are scheduled and available for registration. See complete details under the Hockey tab. The Future Caps Learn to Play program provides the opportunity for kids 5-9 years of age to receive a free complete set of hockey gear while participating in an eight-week instructional program on learning to play hockey. The Haymarket Iceplex anticipates hosting two eight-week sessions for the next season of the Future Caps Learn to Play program; the 1st session will be in October 2019 and the 2nd in January 2020. Details will be made available as the program reaches full definition. We offer figure skating or hockey skating. We run 6 or 7 week classes annually on Mondays evenings and Saturdays mornings. Classes are for ages 3 and UP. Why not plan an ice skating birthday party for your child? Party Options: extra pizzas, extra drinks, extra guests and an extra added option of a 30 minute group instructed class teaching children who are new to the ice how to skate. Parties are held during our scheduled Public Session times only which are Friday, Saturday and Sunday. Party Room is for 1 hour only either before public session or after public session. Example: If our Saturday public session is from 5:30p to 6:50p then your party room can be from 4:30p-5:30p or 6:50p-7:50p. WE WILL BOOK ONE PARTY PER WEEKEND PUBLIC SESSION! IMPORTANT Note: ON THE SATURDAY MORNING public sessions, they are scheduled from 11:30a-12:50p and the ONLY party room time available is after the public session from 12:50p-1:50p. THERE WILL NOT BE A PARTY ROOM TIME BEFORE THE PUBLIC SKATE AVAILABLE AT 10:30a due to the pizza place is not open yet. See the "Birthday Parties" tab above to the left for more details. Or the top right tab that says "Parties and Events"
Predator Travel registration packets now available on Youth Hockey page! 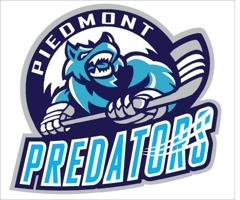 For more information about the Piedmont Predators youth hockey club, click the Hockey tab and see our Youth Hockey page. ©2019 Haymarket IcePlex / SportsEngine. All Rights Reserved.